We are happy to answer your questions. Based in Hedingen, the Ernst Schweizer AG, Metallbau is a long-established, independent family-owned business in the Swiss building sector. Their business activities concentrate on façades, timber / metal systems, windows, letter-boxes and solar energy systems. One of their most recent innovations is the intelligent parcel box. 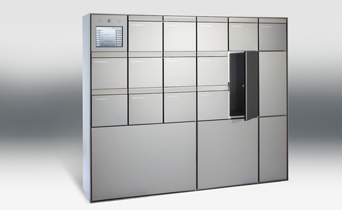 This combines letter-box, parcel box and information terminal in a single unit. Delivery services and private individuals can use an access protected by PIN code to store postal consignments temporarily directly at the house door. 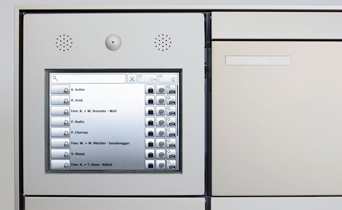 In developing the parcel box plus, Ernst Schweizer AG faced a number of challenges especially as far as the locking unit was concerned. Based on design specification requirements for example, this had to be designed without a handle. This is why the only option was an electromechanical lock with an additional spring function, minimal current consumption and – due to its siting out in the open – a guaranteed temperature resistance in the range -30 to +70 °C. Furthermore, it was required that the installation and fixing of the lock in production would be relatively simple. After a brief survey of the market, the Ernst Schweizer AG found the ideal solution at the manufacturers Southco, and got in touch with the general agency for Switzerland, KVT-Fastening. Possibilities were was evaluated in close co-operation and it was soon evident that one of the Southco locks distributed by KVT-Fastening corresponded most closely with the ideal requirements as laid down by Schweizer. The excellent business relationship which had already been established many years helped solve this particulate problem very quickly. KVT-Fastening supported Ernst Schweizer AG In developing the parcel box plus throughout with commitment and professionally in all aspects of the work. The lock unit selected is ideally suited both in function and size. Thanks to the smooth collaboration, Ernst Schweizer AG has already secured its first orders for the “intelligente Paketbox plus“ and some of them have already been installed. 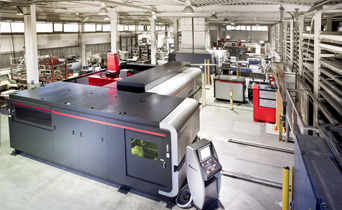 BVS Blechtechnik GmbH, with headquarters in Böblingen, is one of the leading sheet-metal working companies in Germany. 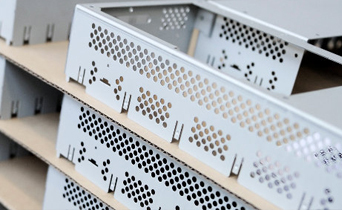 As well as developing and manufacturing assemblies of thin sheet, installation of subassemblies and electronic components, BVS also undertakes contract manufacture of terminal units. 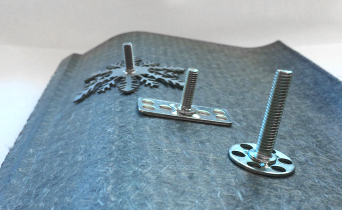 Around 65 % of its products incorporate fastening elements such as self-clinching fasteners, blind rivets, blind rivet nuts, hinges, straps or handles. 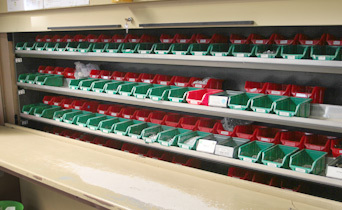 All told, BVS uses around 200 different fastening elements and the company's need for a solution to automating its C-parts management was correspondingly large. Up to that point, every week an order was placed manually, which might well involve over 50 different items, and when it was received it would have to be processed – again manually – in Goods Inwards. In place of this complicated system of C-parts management, the company wanted to have an automated system shaped for the future which covered everything from the ordering procedure to receipt of the goods integrated into its production processes. The specifications were as follows: administration work reduced to the minimum necessary, time saved in handling and high reliability of the supply chain. Up to now, a single missing component has sometimes had a disastrous effect on the production line, even on occasions bringing it to a stand. BVS found the answer to their search for a suitable solution which could be implemented at short notice at their long-standing partner KVT-Fastening. 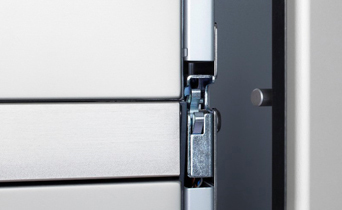 Bossard's fully-automatic SmartBin system fulfilled all the BVS requirements perfectly and the system went into service in May 2014. 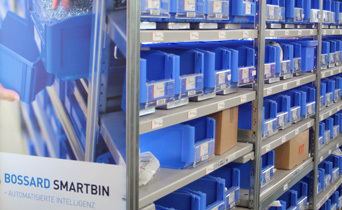 With the introduction of SmartBin at BVS, the work involved in ordering parts and in Goods Inwards has been drastically reduced. Where previously one person was occupied two days a week doing nothing but preparations, listing batch sizes and determining the optimum day for placing orders, now all the orders are placed automatically and only when a predetermined minimum stock level is reached. This level is determined by the scales integrated into the SmartBin. Goods Inwards further benefits from the fact that delivery notes are now generated electronically. That saves an entire morning's work because the individual packages no longer have to be processed manually, and can be sorted direct into the corresponding open-view storage bins. Automated reordering safeguards against interruptions in production. 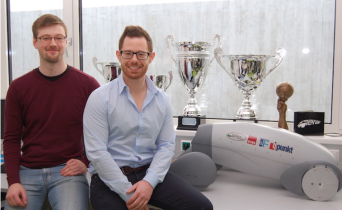 With many awards to their credit, the TERA student group at the Graz University of Technology develops and constructs electrically-propelled vehicles. Formed in 2009 as the Team Eco-Racing Austria, it was renamed TERA TU Graz in 2012. Since then, the student group has produced the electrically-propelled vehicles ""Fennec"" (Desert fox) and ""Panther"". In the Shell Eco-Marathon on the Lausitz Ring in 2011, Fennec achieved a world record in the category 'Prototype Battery Electric'. In 2014, the single-manned vehicle covered 1,091.6 kilometres on a single kilowatt-hour of electricity. With IBEX, the latest creation, for the first time in 2016, the group is developing a vehicle to be registered for use on public roads. The electromobile IBEX with its tare weight of about 400 kg (without batteries) is intended to have a range of 250 km and a top speed of 130 km/h on a 370-km-long racing circuit. 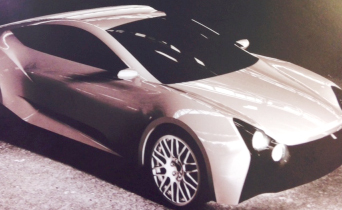 To construct such a lightweight, the team is relying on carbon fibre-reinforced plastic (CRP). 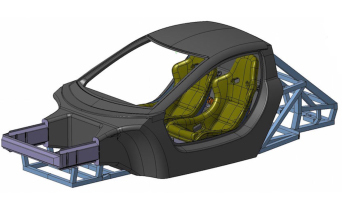 A monocoque of this material weighing just 65 kg forms the passenger cell and the two passenger seats, seat-belts and mounting bracket for the fire extinguisher all have to be installed in it. Every bit of work on the carbon fibre shell however represents a potential breaking point and means a loss of both strength and rigidity and thus affects the safety of the occupants. This is something to be avoided at all costs. For the CRP chassis, reliable load-bearing fixings were needed. 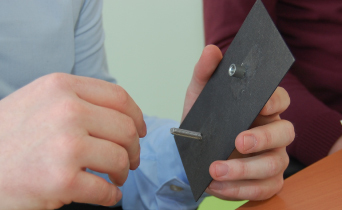 Therefore TERA TU Graz team turned to the fastening technology specialists KVT-Fastening, with whom a business relationship has now existed for several years. The fastening experts supplied suitable materials for the electromobile Fennek, world champion in the energy efficiency class at Shell Eco-Marathons in 2011 and 2014. KVT-Fastening was also able to help with its expertise and experience in further development of the IBEX. The experts examined the special requirements of the IBEX, showing the team the possibilities and developed new technologies to satisfy the strict requirements for approval as a road-going vehicle. KVT-Fastening then made 200 Keensert threaded inserts, 100 blind rivet nuts and 100 bigHead fasteners available by sponsorship.erfügung. 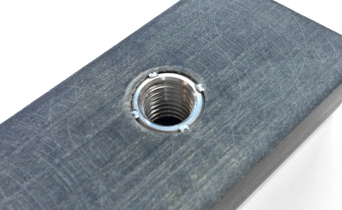 To create load-bearing connection points for the safety-relevant parts in the interior, bigHead fasteners were inserted directly in the carbon-sandwich-panel matrix and laminated in. This makes it capable of withstanding the enormous forces involved in a collision or an emergency brake application on the road. For exceptional force pathways bionic principles were used. The fibre reinforcement around each of the fasteners encloses it as vegetable fibres enclose the branch of a tree growing out of its trunk. Following lamination, the carbon shell and the connections harden off into a securely-bonded passenger cell, the monocoque. The TERA TU Graz team trod new paths when assembling the bodywork and the rounded carbon monocoque. 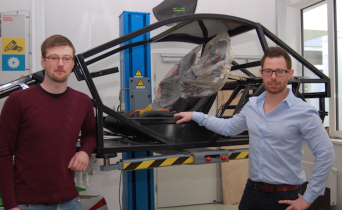 3-D load-spreaders developed by KVT-Fastening were used, and these had to be attached to the monocoque with an innovative bonding technology accurately and in record time. Wet bonding is standard in the automotive industry; in this, a special adhesive is applied and the part is attached within 20 to 30 seconds to the surface by drying. On IBEX, a heated tablet of adhesive is used and this forms a firm bond within seconds when cooling down. As the internationally leading specialist for industrial fastening technology the KVT-Fastening offers sophisticated, high-quality individual components and customer-specific solutions for applications in a variety of industries and sectors. The company belongs to the Bossard Group as a globally leading provider of intelligent solutions for industrial fastening technology.